Ahead of the arrival of Fortnite Season 7 later today, Epic Games has revealed details about the Fortnite Season 7 Battle Pass. 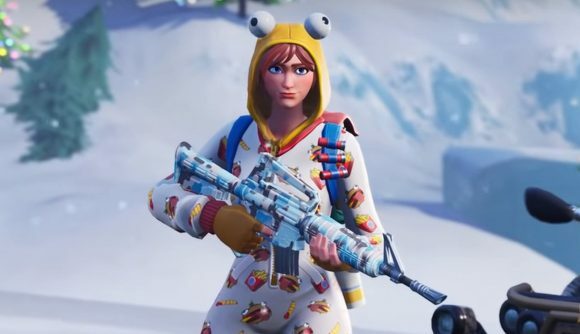 The battle royale’s monetisation model returns for the new season with more cosmetics, but there are plenty of new categories for the snowy new season. The headline change is the introduction of wraps, which finally brings weapon skins to Fortnite. ‘Wraps’ allow you to customise your guns and your vehicles with designs based off your new skins. Old rewards are still around, however, and you’ll be able to earn new pets and toys, including an adorable gerbil, and hockey pucks so you can make use of the game’s new frozen biome. Elsewhere, you’ll be able to earn the same skins, sprays, and contrails that you always could as you level up the pass. As we’ve seen in previous seasons, there’ll also be progressive skins that you can add to as you progress through the seasonal challenges. Zenith and Lynx will unlock at the base of the Battle Pass, while you’ll need to get to tier 100 to unlock the new Ice King skin. You can check out a full video detailing some of the new cosmetics in the trailer below. Fortnite Season 7 kicks off later today, after a period of downtime that began at 9:00 GMT. There’s plenty of new content on offer, from zip-wires to biplanes. The new season also ushers in an early test of Fortnite Creative, a new mode which drops you on your own private island and lets you build your own game modes for you and your friends.